News – Matthew Lawson, M.D. For the first time in history at Tallahassee Memorial Hospital, 5 neurosurgeons were simultaneously operating in 5 separate operating rooms. I’m proud to be a part of this great practice! TNC Neurosurgery! Left to right, Dr. Beaty, Dr. Rumana, Dr. Lee, Dr. Oliver, and Dr. Lawson. We are officially enrolling patients in the NEWTON2 trial in Tallahassee! I’m proud to announce that Tallahassee Neurological Clinic (TNC) is participating the NEWTON2 trial, and we are currently enrolling patients. NEWTON2 is a phase 3 randomized trial evaluating intraventricular nimodipine (EG-1962) versus standard of care oral nimodipine in patients with subarachnoid hemorrhage due to ruptured brain aneurysms. This makes Tallahassee the only center in the region that provides full service cerebrovascular care and cutting edge stroke and brain aneurysm research. Noncontrast CT scan of the head showing classic appearance of subarachnoid hemorrhage. Participating in well designed clinical trials, such as NEWTON2, helps ensure that the care we provide in the future will be better than the care we provide today. I’m very proud that we are participating in this trial, as it helps advance our field within neurosurgery, and hopefully will improve outcomes for patients with subarachnoid hemorrhage. TNC is the only neurosurgical group in the region with three endovascular neurosurgeons, who provide comprehensive care for ischemic stroke, hemorrhagic stroke, brain aneurysms, and carotid disease. We have an active clinical research division and have participated in numerous device and drug trials for neurosurgical patients. TNC Endovascular Neurosurgeons. Left to right: Dr. Beaty, Dr. Oliver, and Dr. Lawson. Please help us welcome Dr. Beaty to Tallahassee! Tallahassee Neurological Clinic, the most advanced neurosurgery, neurology, and pain management practice in the region, has added its 5th neurosurgeon. Dr. Beaty trained at the University of Maryland for neurosurgery, and did a fellowship in endovascular neurosurgery at Johns Hopkins. With the addition of Dr. Beaty, TNC Neurosurgery and the Tallahassee Memorial Comprehensive Stroke Center have dramatically increased access to cutting edge care for stroke patients. patients from northwest Florida, south Georgia, and southeast Alabama. The Endovascular Neurosurgery program at TMH started in 2012, when Dr. Lawson moved to the area and started the endovascular neurosurgery program. It expanded in 2013, with the addition of Dr. Oliver, and now in 2017, with the addition of Dr. Beaty, it is the best staffed stroke center in the region, without question. Interested in learning more about Endovascular Neurosurgery? Click here. There is a great editorial in JNIS about stoke care at Comprehensive Stroke Centers and ongoing debate about how we as a medical community should address the inefficiencies in stroke care. Worth reading for anybody interested in stroke and stroke intervention. Click below to go to the article. I’m honored to present a lecture on July 12, 2017, at the TMH Neuroscience Grand Rounds. I will be speaking about current treatments for patients with brain metastases. This is a CME event for physicians. Are you a physician? Interested? Call TMH at 850-431-5875 to reserve your spot! Carotid Artery Stenosis is a common cause of stroke. In fact, roughly 7 to 18% of all first time stroke is attributed to carotid artery stenosis in excess of 60%. That means that roughly 1 in 10 strokes is due to narrowing of the carotid artery. Medical Treatment – aggressive medical treatment usually involves aspirin, clopidogrel, a statin, as well as aggressive blood pressure and diabetes control. This may be the best option for asymptomatic carotid stenosis. Carotid Endarterectomy (Surgery) – this is a surgical procedure in which an incision is made on the neck and the carotid artery is exposed. The artery is then temporarily occluded with clamps. The artery is then opened with a scalpel, the plaque is removed, and then the artery is repaired. This has been a common treatment for many decades, and is well studied with very good results. Pre-Treatment, severe >90% left internal carotid artery stenosis. The arrow denotes severe stenosis, or narrowing. This is seen as a tiny string of contrast at the arrow. The external carotid artery, which supplies blood to the face and scalp, fills much more rapidly than the internal carotid artery, which supplies the brain. cath lab. A guide sheath is placed into an artery in the leg, it is navigated to the common carotid artery in the neck, and then the carotid narrowing is treated from within the blood vessel. The narrowed carotid artery is ballooned opened with a balloon catheter and a stent is placed to help keep the artery open. In the images to the right and below, there is a representative example of the treatment of left internal carotid stenosis with angioplasty and stent placement. In the image to the right, the narrowing is a tiny string of contrast at the arrow, which is causing severe limitation in flow into the left internal carotid artery. Below, you can see the post angioplasty and stent results, after the narrowing has been “ballooned open” and a stent placed. Post carotid angioplasty and stent placement. Post treatment, unsubtracted and magnified to see stent inside left internal carotid artery. Dr. Lawson treats carotid disease with all of the methods noted above; medical, surgical, and endovascular. All of his carotid procedures are tracked in a registry (the National Neurosurgery Quality and Outcomes Database, also known as QOD – Neurovascular module) to ensure quality and safety. Learn more about public quality data reporting at the Neuropoint Alliance. Want to learn more? Download the American Stroke Association guidelines for the management of carotid disease here. Click here to contact the office for an appointment. I’m pleased to be one of the invited speakers to the Baptist Health Care Stroke Symposium in Pensacola, set for May 19, 2017. I’ll be speaking about Hemorrhagic Stroke as well as the role of the TMH Comprehensive Stroke Center in our community. This conference is geared for all health care providers, including physicians, ARNPs/PAs, nurses, therapists, and EMTs/paramedics. CEUs are provided. Lumbar Microdiscectomy is one of the most common neurosurgical procedures performed in the United States each year. This surgical procedure is a often performed to remove a herniated lumbar disc, which is a common condition. Most of the time, a lumbar herniated disc causes severe shooting pain into the leg, often called lumbar radiculopathy. The best way to understand this operation is to consider a recent case. A middle aged patient presented to the office with moderate low back pain and severe pain shooting down the back of the thigh and around the knee. It was severe and shooting in nature. The patient said it was 7 out of 10 in severity, even while taking narcotic medications, which they received after an ER visit. Axial T2 MRI. This image shows the right L2-3 disc herniation. When viewing MRI in the axial plane, the patient’s RIGHT side is on the left side of the screen. CT Myelogram or MRI study is sufficient to identify a herniated disc. If it explains the patient’s symptoms then surgery can be considered. After the diagnosis of a herniated disc the patient usually has a trial of conservative (non-operative) treatment. This may include physical therapy, chiropractic manipulation, steroids, other anti-inflammatories, gabapentin, or other medications. If these treatments alleviate the patients’s pain then they may not require surgery. If the patient has continued pain surgery may be considered. Typically, surgery to remove a herniated disc is called a “lumbar hemilaminotomy and microdisectomy.” This surgery is performed on the back. A small incision is made over the spinal levels of interest (this is confirmed with x-ray or fluoroscopy at the start of surgery). After making an midline incision, we dissect down to expose the lamina, or part of the bone overlying the dura. This is done on the left or right side (it is done on the side that corresponds to the patient’s pain and side of disc herniation), at the level of the herniated disc. A small window of bone is then removed with a drill to expose the ligament underneath. Once the ligament is removed, we can see dura, or sac containing the lumbar nerve roots. 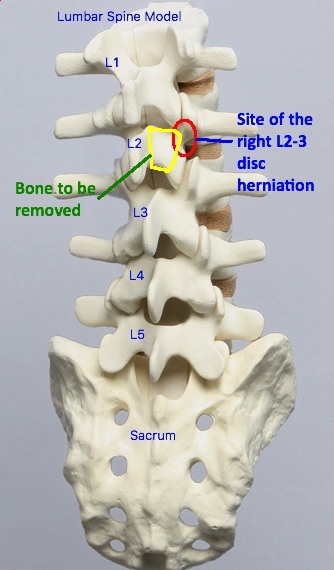 The models below show the location of this patient’s disc herniation and the planned lamina that will be removed. Normal Lumbar Spine Model. 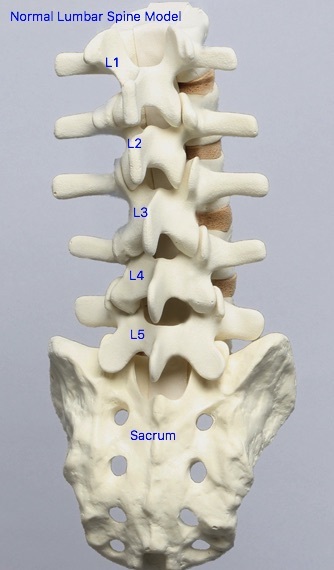 The lumbar vertebrae are labeled L1 through L5. Lumbar Spine Model, with red circle at the approximate location of the right L2-3 herniated disc, as seen on this patient’s MRI (above MRI images). The yellow area is the planned area of bone removal (called a hemilaminotomy) to expose the dura and herniated disc. In the images below we can see the view through the microscope during this microdiscectomy surgery. 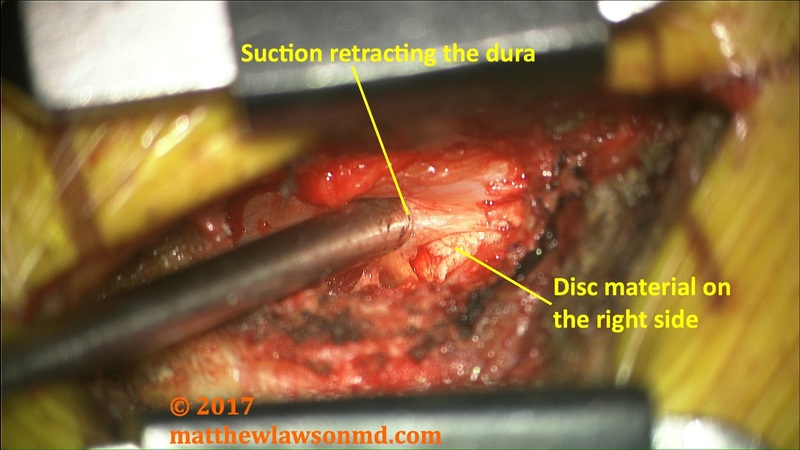 We have exposed the dura, gently retract it medially, and then remove the herniated disc material. Microscope View. For reference, the feet are on the left, the head is to the right, the top of the image is the midline, and the patient’s right is the bottom of the image. Here, we have removed the lamina and ligament, and the dura is in view. One can see a small amount of herniated disc material off to the right side of the dura, in the lateral gutter. Microscope View. For reference, the feet are on the left, the head is to the right, the top of the image is the midline, and the patient’s right is the bottom of the image. Here, we have gently pushed the dura towards the midline to get a better view of the herniated disc material. Microscope View. For reference, the feet are on the left, the head is to the right, the top of the image is the midline, and the patient’s right is the bottom of the image. Here, we have gently pulled a large fragment of disc up and out of the lateral gutter. It is sitting on top of the dura just prior to removal. After removing the disc material, any bleeding is controlled with bipolar electrocautery. The wound is irrigated out with an antibiotic saline solution, and the dura is covered with gelfoam. The retractors are removed and the wound is closed. 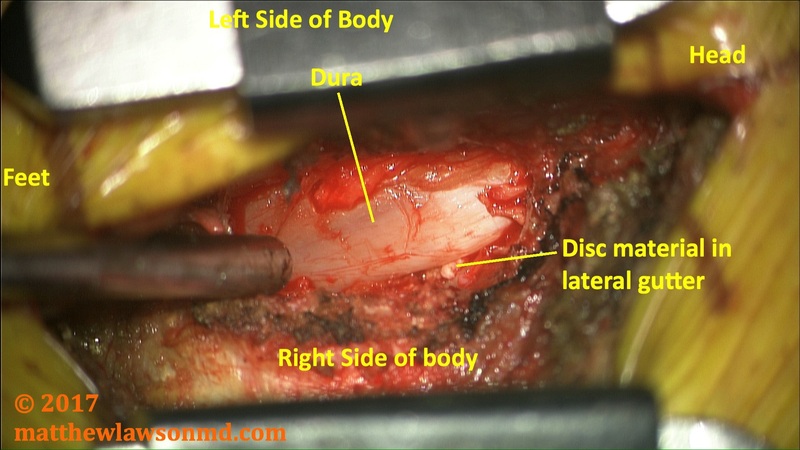 This image shows the disc material removed in this particular surgery. In this case, we were able to remove a large amount of herniated disc material. The patient did quite well, with resolution of the leg pain shortly after surgery. This article is a great overview of the development of new neuroendovascular techniques and technology for the treatment of cerebral aneurysms. I am proud to say that Tallahassee Neurological Clinic and Tallahassee Memorial Healthcare were involved in clinical trials for some of these devices (PulseRider and Barrel) and we routinely use Pipeline Flex in our practice. Check out the full article by clicking the link below. Although Dr. Lawson specializes in cerebrovascular surgery & endovascular neurosurgery, he also performs complex cervical and lumbar spine surgery. Roughly 45% of his practice is related to brain tumor surgery and cerebrovascular/endovascular neurosurgery (brain aneurysms, stroke, AVMs, and carotid disease). The other 55% is general neurosurgery, including complex cervical and lumbar spine surgery. In fact, Dr. Lawson performs much of the complex cervical spine surgery at TMH. CT scan showing C4 burst fracture. 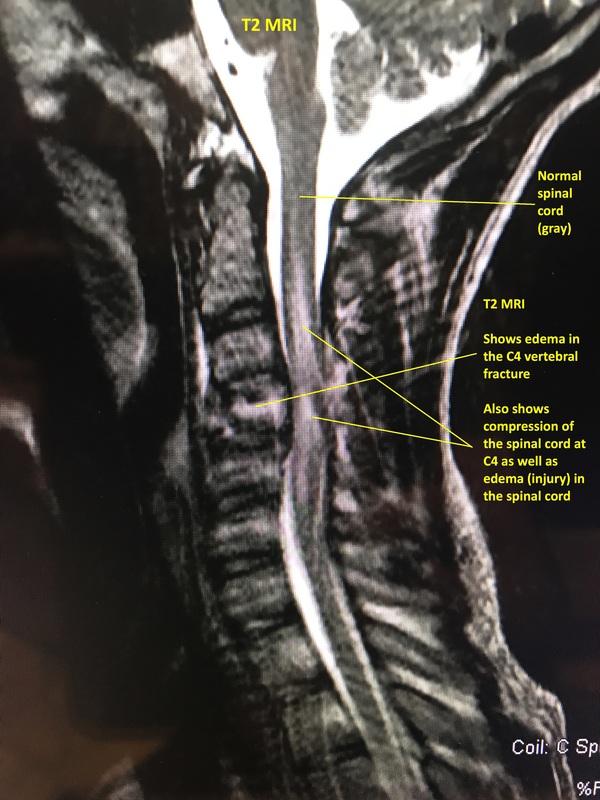 Recently, a young man presented as a trauma alert to the hospital with a suspected spinal cord injury. He was involved in an accident and was unable to use his arms or legs. 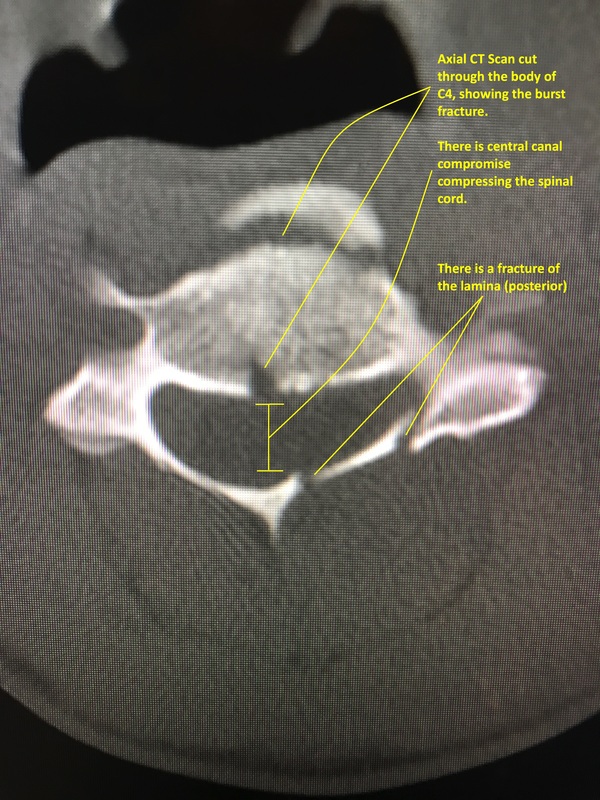 His initial CT scan of the cervical spine demonstrated a C4 burst fracture with central canal compromise. This is a complex fracture that resulted in a spinal cord injury. An MRI was performed, which confirmed the degree of spinal cord compression and injury. It was felt that surgery was his most reasonable treatment option. Surgery would involve two procedures: an anterior cervical corpectomy and a posterior cervical stabilization. CT Scan (axial image) showing C4 burst fracture, lamina fracture, and central canal compromise. MRI Showing compression of the spinal cord and spinal cord edema. In the images to the left, we can see the axial CT scan, which shows the C4 burst fracture, a lamina fracture, and central canal compromise. The MRI image seen to the left (below the axial CT scan), shows some central spinal stenosis with edema of the spinal cord. The spinal cord is the gray structure in the middle of the image, running from top to bottom. There is white, haziness noted in the cord, which is spinal cord edema (this is indicative of a spinal cord injury). One can also appreciate how the fractured bone pushes into the spinal cord. Clinically, this patient had a severe spinal cord injury, with the inability to move his arms or legs upon arrival to the hospital. Post OP CT showing the bone strut and anterior cervical plate after the C4 corpectomy. cervical plate is then placed from C3 to C5 to hold the strut in place. Next, the patient was flipped into the prone position (face down) so that the second phase of the procedure can be performed on the back of the neck. 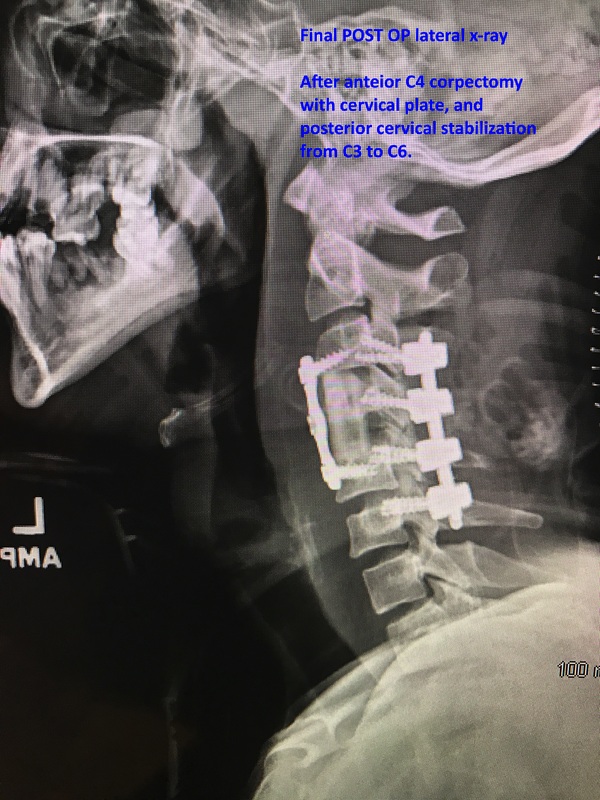 A posterior cervical stabilization with lateral mass screws and rods was performed from C3 to C6. 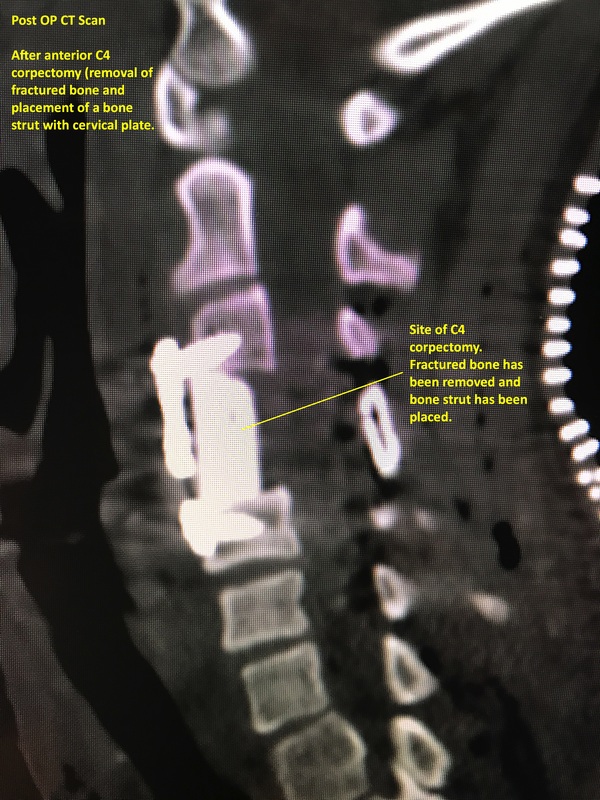 In addition, a cervical laminectomy was performed at C3 to C5 to ensure decompression of the spinal cord. The final result is the x-ray seen below. In this x-ray you can see that the C4 fracture has been removed, a bone strut is in its place, there is an anterior cervical plate (on the front of the spine) as well as posterior screws & rods (on the back of the spine). Post OP lateral x-ray, showing all hardware in place. This patient did very well after surgery, and regained partial use of the right arm and leg. He was transitioned to rehabilitation. Clearly, he has a long road of rehabilitation in front of him for his spinal cord injury, and we are excited to see how he is doing at the six month interval. ACDF (Anterior Cervical Discectomy and Fusion) – a common procedure for treatment of herniated cervical discs, typically causing neck and arm pain. 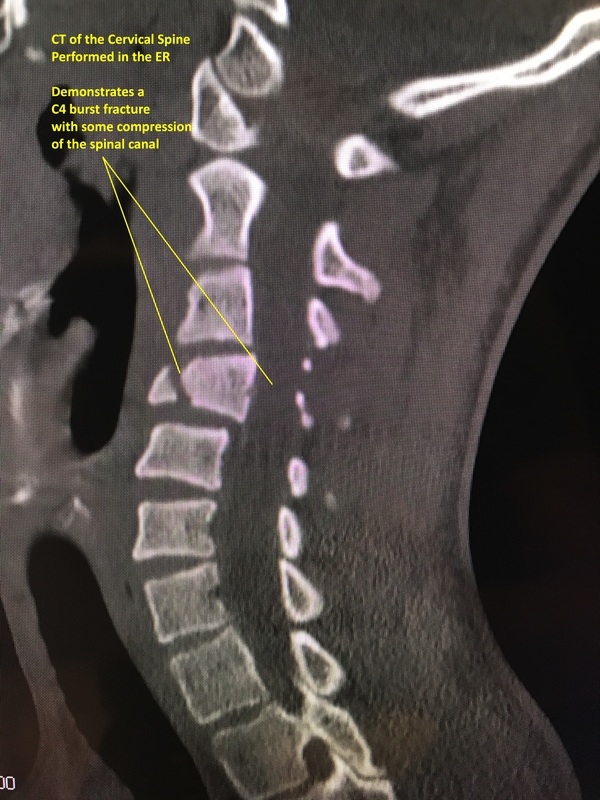 Posterior Cervical Laminectomy and Fusion – for treatment of cervical stenosis and cervical myelopathy. C1-2 Stabilization – for instability, fracture, or compression at C1 or C2. Most commonly, this is for treatment of C2 fractures or rheumatoid arthritis with compression of the spinal cord at C1-2. O-C Stabilization – for instability, fracture, or compression at the craniocervical junction. Complex cervical spine procedures (such as the C4 corpectomy and posterior stabilization described above) for the treatment of deformity or fracture. Neck pain? Cervical spine fracture? Click here to contact Dr. Lawson and make an office appointment. The most common brain tumors are actually metastatic brain tumors, or cancerous tumors from other parts of the body that have spread to the brain. Common cancers that cause brain metastases include breast cancer, lung cancer, renal cell cancer, and melanoma. In fact, brain metastases are nearly twice as common as primary brain tumors, which are tumors that start in the brain itself (have not spread from some other cancerous site). Each year in the US there will be about 250,000 people diagnosed with a new brain metastasis, as opposed to about 80,000 primary brain tumors. Primary brain tumors include meningiomas, gliomas, pituitary tumors, and other rare tumors that I will discuss in a later post. Since metastatic brain tumors are cancers that have spread to the brain from some other primary site (lung cancer, breast cancer, kidney cancer, melanoma, etc. ), it is postulated that the number of brain metastases diagnosed each year will rise as patients live longer with their primary cancers. Metastatic Brain Tumors may occur at any site within the brain, and symptoms are based on the location of the metastasis. Since the location of metastatic tumors is highly variable, symptoms experienced may be highly variable. Some common and nonspecific symptoms include headaches, nausea, and vomiting. Seizures may occur due to brain metastases, and these are usually treated with oral medications and removal of the tumor. Finally, neurologic impairment related to the tumor may occur. An example of neurologic symptoms related to a metastasis could be left arm weakness due to an enlarging tumor in the right frontal lobe (the area of the brain related to left arm movement). In general, there are several treatment options for metastatic brain tumors: surgical resection of the tumor, brain biopsy for diagnosis, stereotactic radiosurgery (SRS), whole brain radiation therapy, and post treatment observation and surveillance. Often, patients with metastatic brain tumors undergo some combination of the above treatment options. Surgical Resection – Large brain metastases may cause neurologic symptoms by compression of the brain or edema (swelling). Surgical resection, or removal of a tumor with surgery, is a common method of treating symptomatic brain metastases. This surgery involves an incision on the scalp, opening of the skull (a craniotomy), and then surgical removal of the tumor. Local tumor control is improved by adding radiation treatment to the tumor bed after surgery is performed and the incision has healed. Resection has the additional benefit of allowing a pathologist to examine the tumor after it is removed, which often allows them to determine the site of origin. Stereotactic Radiosurgery (SRS) – SRS is a method of high precision radiation treatment for brain tumors, where a very high dose of focused radiation can be directed at one or more tumors. SRS allows high dose radiation to be delivered to a target (tumor) and a relatively small dose to the surrounding tissues. Dr. Lawson performs radiosurgery with local radiation oncologists, and you can learn more about SRS here. There is some evidence that radiosurgery has better cognitive outcomes and equal efficacy compared to whole brain radiation. Check out a recent article in JAMA on the issue here. Whole Brain Radiation – Sometimes, there are numerous small brain metastases, too small or too numerous for surgical resection or radiosurgery. Whole brain radiation delivers a moderate dose of radiation to the entire brain. This treats both the tumors as well as brain tissues. It is effective, but may have long-term cognitive site effects (this is controversial). Brain Biopsy – Occasionally, tissue diagnosis is needed for a brain tumor but the tumor is not in a location safe for surgical resection. Stereotactic Needle Biopsy may be a good option for obtaining tumor tissue for analysis and diagnosis. In this procedure, the patient is taken to the operating room and a small needle is passed through the skin, the skull, and into the tumor. This procedure uses computer navigation to accurately direct the needle into the tumor. In general, treatment of patients with brain metastases requires a team approach, with Neurosurgeons, Oncologists, and Radiation Oncologists. The individual prognosis depends on the patient’s primary cancer, their functional status, and how well they respond to the initial treatments. Dr. Lawson works closely with local TMH oncologists and radiation oncologists to give the most comprehensive brain tumor care in the region. Click Here to contact the office. Tallahassee Neurological Clinic and Tallahassee Memorial Hospital have been selected as a site for the NEWTON2 trial, with Dr. Lawson as the local site primary investigator. This phase 3 trial is designed to study the efficacy of a novel substance compared to oral nimodipine for prevention of vasospasm in subarachnoid hemorrhage. This makes TNC and the TMH Comprehensive Stroke Center the only center in the region participating in phase 3 research in hemorrhagic stroke & subarachnoid hemorrhage treatments. Institutional Review Board approval has not yet been granted, but we hope to finalize this in the next few months. The study is funded by Edge Therapeutics. To learn more about the trial, click here. What’s special about the TMH Comprehensive Stroke Center? Why is it important that TMH is a Comprehensive Stroke Center? Comprehensive Stroke Centers (CSCs) are the most advanced hospitals for providing stroke care. Not only have they demonstrated excellence at caring for ischemic stroke and administering TPA, Comprehensive Stroke Centers have gone the extra mile to specialize in stroke diagnosis and treatment, including treatment for all forms of stroke. The only facility in Northwest Florida, South Georgia, and Southeast Alabama with Comprehensive Stroke Center services is Tallahassee Memorial Hospital (TMH). Primary Stroke Centers (PSCs) can be thought of as the minimum requirement for stroke care. PSCs are able to diagnose and treat ischemic stroke. Most PSCs in the region rely on teleneurology, or neurologists available by computer or telephone, to help diagnose and treat patients. Comprehensive Stroke Centers, on the other hand, have in house neurology and neurosurgery services. TMH has 4 employed hospital stroke neurologists as well as 4 board-certified neurosurgeons at Tallahassee Neurological Clinic. Drs. Lawson and Oliver. Board-certified neurosurgeons with neuroendovascular certification (CAST certification) at the TMH Comprehensive Stroke Center. Comprehensive Stroke Centers not only provide excellent care for ischemic stroke, but they also provide advanced stroke care services. This includes care for ruptured cerebral aneurysms, AVMs, and other forms of hemorrhagic stroke. CSCs perform cutting edge procedures, such as thrombectomy for ischemic stroke due to large vessel occlusion as well as brain aneurysm treatment. They generally qualify as high volume treatment centers for aneurysmal subarachnoid hemorrhage, which means they generally have better outcomes than other centers that treat brain aneurysms. Dr. Lawson was one of the first 50 individuals certified in Neuroendovascular Surgery by the Society of Neurological Surgeons. Endovascular Neurosurgery (also known as Neuroendovascular Surgery or Neurointerventional Surgery) is a cornerstone in the Comprehensive Stroke Center model of care. At TMH we have two board-certified neurosurgeons, Drs. Lawson and Oliver, who are also certified in Neuroendovascular Surgery by the Society of Neurological Surgeons (CAST Certification). TMH is the only facility in the region with such highly trained and experienced neurosurgeons. The CAST Neuroendovascular Certification is generally accepted as the highest level of certification for Neuroendovascular Surgery, and the Society of Neurointerventional Surgery endorses this CAST certification. No other physicians in the area have this certification, including those in Pensacola, FL, and Dothan, AL. Drs. Lawson and Oliver are partners at Tallahassee Neurological Clinic, a multispecialty group practice of neurosurgeons, neurologists, and pain management physicians. Dr. Lawson has been in practice in Tallahassee since 2012, and he was the first neurosurgeon in the region to perform brain aneurysm coiling or thrombectomy for the treatment of acute stroke. He helped establish the TMH Neuroendovascular Lab and the TMH Comprehensive Stroke Center. Dr. Oliver joined Dr. Lawson in 2013. As of now they share call for Neuroendovascular services for the region. In 2017, we expect another endovascular neurosurgeon to begin in Tallahassee. Fig. 1. Right MCA aneurysm prior to treatment. Fig. 2. Right MCA aneurysm at 6 months post treatment with a novel stent, placed at the TMH Comprehensive Stroke Center. The neurosurgeons at TNC have a robust neurosurgical research component that includes research in stroke and brain aneurysm treatment. Neuroendovascular Surgery is a rapidly evolving field, and devices that were made just 10 years ago are now obsolete. Drs. Lawson and Oliver are active in Neuroendovascular research and have several open trials for novel devices and treatments. We feel that offering access to cutting edge medical research is a key component to a successful Comprehensive Stroke Center. For more information about the TMH Comprehensive Stroke Center, click here. Cerebral aneurysm coiling, or aneurysm embolization, is a procedure to treat brain aneurysms so that they cannot bleed. This procedure is performed by highly trained endovascular neurosurgeons (or neuroinerventional surgeons) in specialized facilities, like Tallahassee Memorial Hospital’s Comprehensive Stroke Center. Fig. 1. CT Angiogram showing a large 1.1 cm aneurysm (yellow arrow), which explains this patient’s subarachnoid hemorrhage (not shown). Fig. 2. Diagnostic cerebral angiogram showing the right vertebral artery and basilar circulation. The large aneurysm is at the origin of the PICA vessel. Aneurysm coiling is a minimally invasive technique for treating a brain aneurysm, where the entire procedure is performed from inside the blood vessel (an endovascular procedure). This is in contrast to the other method of treating brain aneurysm, surgical clipping. Traditionally, brain aneurysms were treated with open surgery, called clipping, where a small metal clip was placed at the neck of an aneurysm to prevent bleeding. Clipping has been the standard treatment of aneurysms since the 1960’s, and the procedure is highly invasive. Clipping involves making an incision on the scalp, removing part of the skull (a craniotomy), and then placing a clip at the base of the aneurysm. In the 1990’s coiling was developed as a minimally invasive technique to treat brain aneurysms, and it was the first viable alternative to clipping surgery. Coiling “fixes” a brain aneurysm from inside the blood vessel, using long catheters and devices that are navigated to a brain aneurysm from a blood vessel in the patient’s leg. In much the same way that cardiologists treat heart disease with “heart catheterization” the endovascular neurosurgeon treats brain aneurysms with catheterization based endovascular procedures, or coiling. Fig. 3. Unsubtracted angiogram during balloon-assisted coil embolization of the ruptured PICA aneurysm. The blue line denotes the location of the parent vertebral artery as well as the small PICA blood vessel and the aneurysm. Coils can be seen in the aneurysm. The yellow line denotes the location of a balloon catheter that is helping to hold the coils in the aneurysm and protect the parent vertebral artery. Subarachnoid Hemorrhage) as well as unruptured aneurysms. Patients who have a ruptured aneurysm have subarachnoid hemorrhage, and they are often critically ill and in the intensive care unit. Many patients who undergo coiling have unruptured aneurysms, or aneurysms that have not bled. The goal for these patients is to reduce or eliminate the risk of bleeding from the aneurysm in the future by treating high risk aneurysms with coiling. The goal of coiling is to fill the aneurysm with platinum coils, or small devices that cause blood within the aneurysm to clot. This eliminates blood flow in the aneurysm and prevents future bleeding. Most coiling procedures are done with the patient under general anesthesia using a biplane fluoroscopy unit. This specialized x-ray equipment is very similar to that seen in a cardiac cath lab, but it has additional features for cerebrovascular interventions. The first step in any coiling procedure is to perform a diagnostic angiogram. This involves taking high resolution images of the blood vessels of the brain, to identify and understand the anatomy of an aneurysm. Next, a guide catheter is navigated from the femoral artery in the leg, up the aorta, and into one of the major blood vessels supplying the brain. The guide catheter is usually positioned in one of the carotid or vertebral arteries. Fig. 4. 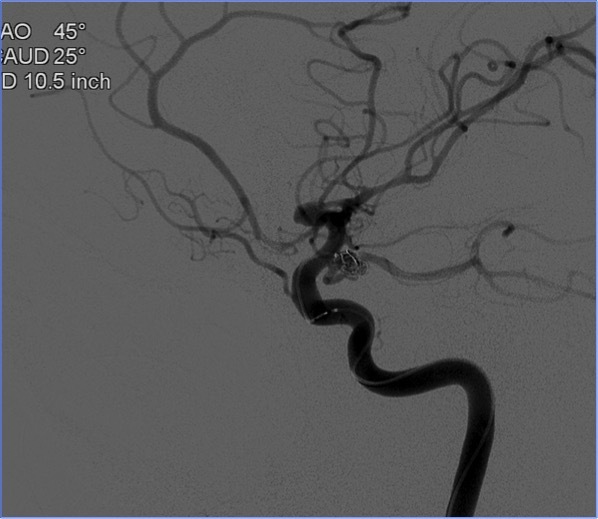 Final result after balloon-assisted coiling with excellent embolization of the aneurysm. After placing the guide catheter, a microcatheter is navigated within the guide catheter and then up into the blood vessels of the brain over a very small wire. This microcatheter is then carefully advanced into the aneurysm. Next, coils are placed within the aneurysm through the microcatheter. Once the aneurysm is treated, the catheters are removed and the patient is awakened. Fig. 5a. Right middle cerebral artery aneurysm before stent-assisted coil embolization. Fig. 5b. Right middle cerebral artery aneurysm at 6-month follow up after stent-assisted coiling with an investigational stent. There is excellent occlusion of the aneurysm. There have been numerous advances in coiling technology over the last 10-15 years. The pace of innovation in endovascular neurosurgery is astounding, as many of the devices on the market just 10 years ago are obsolete. At TMH, we are fortunate to be able to participate in advanced device trials, helping evaluate the next generation of medical devices. Drs. Lawson and Oliver perform traditional coiling as well as advanced stent-assisted coiling, balloon-assisted coiling, and embolization using flow diversion devices. At Tallahassee Memorial Hospital, the region’s only Comprehensive Stroke Center, aneurysm we perform roughly 100 aneurysm embolization procedures per year. Studies have shown that “high volume treatment centers,” or hospitals that care for over 50 aneurysm patients per year, have better outcomes than lower volume centers. For more information about aneurysm treatment, check out the brain aneurysm foundation. Author mlawsonmdPosted on October 16, 2016 Categories Brain AneurysmsTags aneurysm coiling, brain aneurysm, brain aneurysm treatment, endovascular neurosurgery, stent-assisted coiling, subarachnoid hemorrhage1 Comment on What is Aneurysm Coiling? What is Aneurysmal Subarachnoid Hemorrhage? Subarachnoid Hemorrhage, or SAH, is a medical condition where there is bleeding into the subarachnoid space. This space is just outside of the brain and spinal cord, but inside the dura, or the tough covering over the brain and spinal cord. The subarachnoid space contains cerebrospinal fluid, or CSF, which protects the brain, as well as major blood vessels that supply the brain with oxygen and nutrients. The most common cause of subarachnoid hemorrhage is trauma. When a patient strikes their head, such as in an automobile accident or fall, blood vessels in the subarachnoid space may tear and bleed, causing traumatic subarachnoid hemorrhage. This is usually treated with observation and placement of an intracranial pressure monitor, using the Guidelines for the Management of Severe Traumatic Brain Injury. CT Angiogram (CT with contrast in arterial phase) shows 2 brain aneurysms. Patients who present with subarachnoid hemorrhage who have not had a traumatic injury have spontaneous subarachnoid hemorrhage. This is commonly due to an abnormality of the blood vessels within the subarachnoid space that has caused them to rupture and bleed on their own. The most common vascular abnormality leading to subarachnoid hemorrhage is a cerebral aneurysm, or brain aneurysm, but other vascular conditions can also cause subarachnoid hemorrhage. When a patient comes to the hospital with subarachnoid hemorrhage, studies such as CT Angiography or Cerebral Angiography are performed to look for a brain aneurysm or malformation that may have caused the bleeding. Aneurysmal Subarachnoid Hemorrhage is a medical emergency. It strikes roughly roughly 30,000 people annually in the United States. Many of these people are critically ill. Up to 40% of patients with subarachnoid hemorrhage from a ruptured aneurysm die, and many pass away quickly. Symptoms of SAH include sudden onset severe headache (the worst headache of my life, or thunderclap headache), nausea, vomiting, lethargy, coma, and sometimes focal neurological impairment. They may also develop seizures, elevated pressure in the brain or hydrocephalus, and aneurysm re-rupture. When patients arrive in the Emergency Department with SAH, they will often require intubation (placement of a breathing tube) and transfer to a specialized hospital, such as a Comprehensive Stroke Center (CSC). SAH patients are then cared for in neurological intensive care units, usually at Comprehensive Stroke Centers. The goal of treatment is to support the patient, control blood pressure, and give medications to prevent a complication called vasospasm. About half of all SAH patients will need a ventricular drain to relieve hydrocephalus, a common complication of subarachnoid hemorrhage. The ventricular drain is a small catheter or tube that is placed into the fluid-filled spaces in the brain, the ventricles, which drains fluid to a collection system outside of the patient. This ventricular drain helps reduce the buildup of cerebrospinal fluid and helps relieve elevate intracranial pressure. (1) Lateral angiogram demonstrating two aneurysms, with a microcatheter placed into the PCOM aneurysm for coil placement (embolization). Once the patient with SAH is stabilized, the goal is to repair the aneurysm so that it cannot bleed again. Usually, this is done within the first 24 hours after admission to the hospital. Aneurysm repair does not generally change the condition of the patient, but it does prevent further bleeding from occurring. A brain aneurysm can be repaired in one of two ways, microsurgical clipping (open surgery) or endovascular embolization (often called coiling). Microsurgical clipping is done in the operating room, and a craniotomy is performed. The aneurysm is then “fixed” when a small titanium clip is placed across the bottom of the aneurysm (or neck), which prevents future bleeding. There are risks and benefits to each of these treatments, but most ruptured aneurysms at TMH are treated with endovascular embolization (coiling). (2) Coils can be seen within the PCOM aneurysm. Aneurysm embolization (coiling) is performed in a specialized cath lab, similar to a cardiac cath lab or interventional radiology suite, and is usually performed by an Endovascular Neurosurgeon. Small catheters are placed into the femoral artery in the groin and navigated up into the head, where aneurysms are treated from inside the blood vessels. Click here to learn more about Endovascular Neurosurgery. The first 10-12 days after aneurysm rupture are usually spent in the ICU, and then the focus of care shifts towards rehabilitation. The average stay in the hospital is about 3 weeks. Many patients will require inpatient rehabilitation after aneurysmal subarachnoid hemorrhage. After a patient leaves the hospital, continued follow up with the neurosurgeon is critical. Want to learn more? Check out the Brain Aneurysm Foundation. Author mlawsonmdPosted on August 28, 2016 Categories Brain Aneurysms, StrokeTags aneurysm coiling, brain aneurysm, brain aneurysm treatment, cerebral aneurysm, SAH, subarachnoid hemorrhage1 Comment on What is Aneurysmal Subarachnoid Hemorrhage? Tallahassee Memorial Hospital received the American Stroke Association Get with the Guidelines Gold Plus recognition for excellence and consistency in compliance with stroke center quality measures. Great job team! TMH Becomes the Region’s ONLY Comprehensive Stroke Center! June 7, 2016 – TMH announces their new designation as a Comprehensive Stroke Center by the Agency for Healthcare Administration, making TMH the only Comprehensive Stroke Center in the region. TMH has received the American Stroke Association “Get with the Guidelines” Gold Plus recognition for stroke care, and we are proud to be the only hospital within hundreds of miles with the Comprehensive Stroke Center designation. Dr. Lawson and his partner, Dr. Oliver, are the only board-certified neurosurgeons in the region with advanced certification in endovascular neurosurgery (CAST certification). They treat nearly 100 brain aneurysms per year, perform cutting edge thrombectomy procedures for the treatment of acute stroke, and countless other cerebrovascular procedures. Together, TMH and Tallahassee Neurological Clinic are setting the standard for stroke and cerebrovascular care in Florida’s panhandle, south Alabama, and south Georgia. WCTV featured Dr. Lawson’s patient, who underwent cerebral aneurysm treatment with an investigational device, on the local news. Please take a look at the WCTV story. TMH is one of 28 sites in the U.S. participating in the Barrel Trial for brain aneurysm treatment. Drs. Lawson and Oliver at Tallahassee Neurological Clinic (TNC) are enrolling patients in the Barrel Trial, a study to evaluate the safety and efficacy of a new intracranial stent. TNC/TMH is one of only 28 centers in the United States selected to participate in the trial. Read the TMH press release here. Read the article in the Tallahassee Democrat here.